Have you ever read a guide book about the city where you grew up? It is so impersonal that you sometimes hardly recognise it. You know the places mentioned but you cannot feel the soul of it. To grab the essence of a city you need to focus your mind on what matters and where you think the soul is. To figure it out you must be able to limit your time to a day. Drop the guide. Just get to the heart of it. Make it timeless. Off-the-cuff. I lived in Paris for many years before moving to Asia. I have worked on several cases of destination branding for cities or countries but never actually thought about how I would position the city I know best. We all can feel a city with our five senses. I see Paris with a lot of nostalgia and I strongly believe is a city that should be visited almost unprepared. That’s how I see it, how I feel it and how I like it. And what I told a friend once. But what would I do if I had a day to capture its soul? Saint-Germain-des-Pres and Quartier Latin is where it all started. That is the heart and the most meaningful area of Paris, where all the famous french writers lived and partied between the 40’s and 60’s. 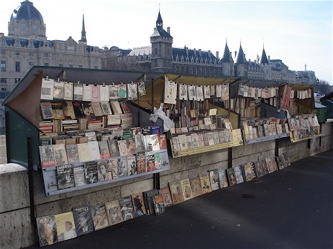 Walk by the Seine river and all the booksellers (bouquinistes). Flip through the books, century-old postcards, 1950 magazine covers with Jacky Kennedy at her best. It’s a gold mine. Take your time. 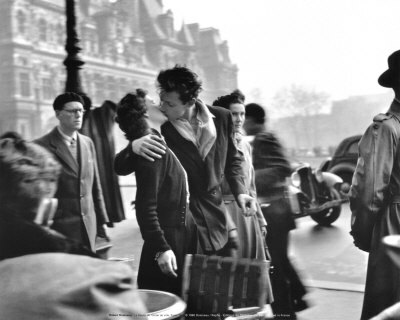 Have breakfast at the Cafe de Flore on Boulevard Saint-Germain and enjoy looking at all these fancy people who know how good looking they are. In June, girls enjoy wearing their shortest skirts (makes you wonder where they are in winter??) and the guys are wearing their cool cream jacket and fancy Ray Ban shades with their blackberry in their hand. Visible. 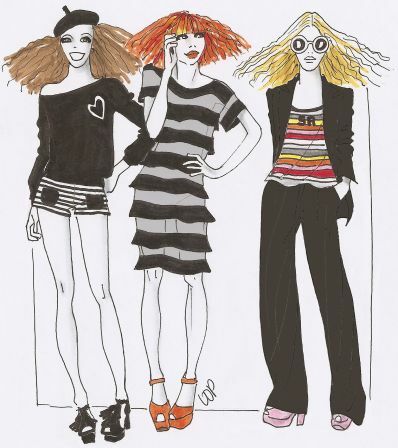 Go shopping and spend an outrageous amount of money (who cares? ), cross the Seine to visit Le Louvre for a couple of hours, without a guide. Off-the-cuff. Just walk around. Look and listen. You may meet Mona Lisa. You may not. 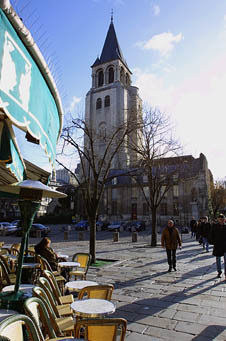 Stop to have a coffee at the counter (zinc) at a bistro near by Notre-Dame cathedral. Don’t sit. Stay at the counter. And listen. The best, funniest and most surreal stories are there. All, irrespectively of profession, class, age or origins, are meeting at the counter for an espresso or a glass of wine. Stories, opinions and arguments.That is where the soul of Paris lies. After having filled up your digital camera memory card by having taken a ridiculous amount of pictures, you may walk back through the Jardin des Tuileries while listening to a small jazz band playing on the side. They don’t play for money. Just because they like it. They like the sound and the moment. So do I. And so will you. Walking in Paris without really knowing where you go is the best. Turn left, look right, go straight. Open your eyes. Open your ears. All is worth being seen and heard. The best and the worst (it’s France after all..). Love it. Hate it. Anything but the mundane. Cross the Pont Neuf at sunset with the Eiffel tower in front of you. She has been there for 120 years (I say “she” because she is a lady…). Walk along the Champ de Mars. Lovers are still kissing, children are playing, hands are holding. Discover covered streets that you think nobody else knows beside you. There is a painting gallery at the end of it. You just found a hidden gem. The owner talks to you for an hour about the paintings, the painter, the stories. He won’t do it for your beautiful eyes but just because he is passionate and he likes talking about it. End the day back in Quartier Latin, underground, listening to good old Jazz music. That’s where you realise why all this people are saying Paris is the most romantic city in the world… Because it actually is. What matters is not where you went during that day but how you went there. And why you went there only following your senses and instinct. Off-the-cuff. How would you capture the soul of the city where you grew up, in a day? If you like this article, please subscribe to this blog to receive updates and new posts directly by email. ← Can we copy whatever brand tagline whenever we want? So good and so true! I really enjoyed reading this, Fabrice. My best travel experiences have come from letting go of a schedule and just wandering around. Dear Eva, thank you very much for your kind words.